CANTON, Ohio — Over 30 students from a high school in North Canton, Ohio attended a recent Board of Education meeting to urge the district to continue hosting graduation ceremonies at a local church despite pressure from a prominent atheist activist organization. 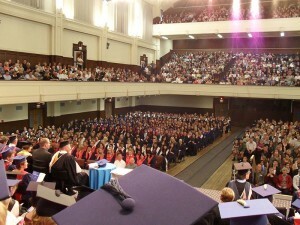 In 2012 and 2013, Hoover High School held its commencement ceremony at Faith Family Church, a large church with seating for over 4,000 people. However, earlier this year, a parent complained about the location to the Freedom From Religion Foundation (FFRF), which in turn wrote a letter to the district, alleging that officials were violating the Establishment Clause of the U.S. Constitution. FFRF then requested that the district “select a more appropriate, secular location” for the event. In turn, the district decided to move the location for the 2014 ceremony, but has not yet solidified the venue. On Wednesday, a number of students from Hoover High School attended the North Canton City Schools Board of Education meeting to speak out in support of hosting graduation ceremonies at the church. According to the Canton Rep, 18-year-old Matt Sahadi spoke to the board about a petition he had circulated, which was signed by over half of the senior class within just a few day’s time. Sahadi asked the district to reconsider bowing to the demands of the FFRF and listen to the desires of the students. As previously reported, a federal judge in South Carolina rejected similar argument from a national humanist organization that sought to stop a local elementary school from hosting its graduation ceremony at a university chapel. In May of this year, an anonymous couple contacted the American Humanist Association (AHA) to complain that Mountain View Elementary School had held its graduation ceremony at the chapel on the campus of North Greenville University, a Christian institution in Traveler’s Rest. AHA soon sued the Greenville School District, seeking to force officials to change the location and stop the district from allowing student-led prayers to be presented during the ceremony. The case, however, still moved forward to trial, which Anderson has requested be expedited.